Need the perfect Christmas card for a bird or animal lover? The nineteenth and early Twentieth century public domain is packed with Christmas illustration for the animal lovers in your life. 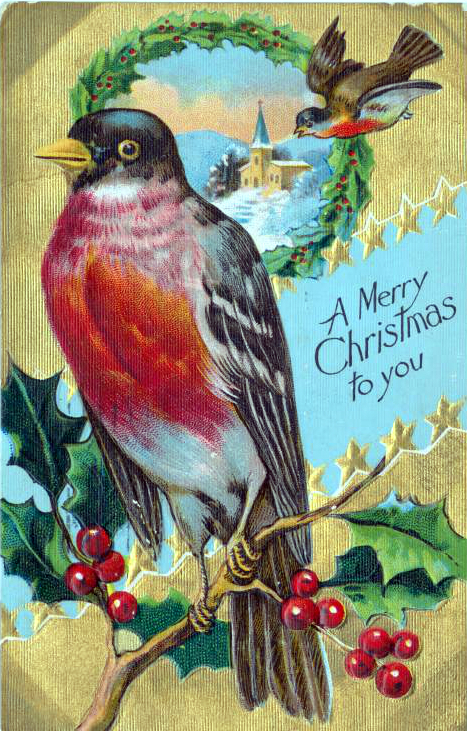 Originally published by Bamforth & Company in 1908, This vintage holiday greeting card features a Christmas robin perched on a holly branch and front of a gold background. It can also be found at the New York public library’s public domain collection. Why were Robins such a popular Christmas illustration? It all comes back to a classic Christmas legend from the UK where legend holds that the classic bird received its signature red-breasted look from Jesus himself, as the blood from Jesus’ crown of thorns turned the robins chest red. For more Christmas illustration and the stories behind them, check out the complete Christmas image Library right here. Or browse the archives for more festive posts!